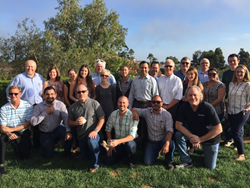 Lajollacooks4u, San Diego’s premier team building events and cooking events company, announced today that 2016 was a banner year for team building events, new program offerings and company expansion. This is largely due to its team building event focus, which it expanded earlier this year to include groups of over 30 people. Ever since, Lajollacooks4u has seen significant demand for its services from organizations across the globe, and its customers include some of the world’s largest companies in healthcare, manufacturing and many more industry sectors. Just last month, it welcomed in a leading biotech organization for the fourth time! Lajollacooks4u, founded in 2008, provides an ideal activity for corporate team building, couples and any foodie looking for a unique cooking and culinary experience in a magnificent setting overlooking the Pacific Ocean. Based in La Jolla, a suburb of San Diego, CA, Lajollacooks4u has enjoyed record growth since its inception in 2008 and has been ranked as one of the area’s top attractions on the popular travel review site, Trip Advisor. In November 2015, Chef Jodi Abel also released her cookbook, Lajollacooks4u: California Cuisine, an accumulation of the favorite recipes her guests have been raving about. For more information about her cooking events, as well as her cookbook, please contact jodi(at)lajollacooks4u(dot)com or visit http://www.lajollacooks4u.com.